I love a good print and if it is stuck onto a skirt, I seem to like it even more. Florals, stripes, polka dots, you name it: it is a great way to amp up an outfit. Just pair it with a plain tee and you’re good to go. 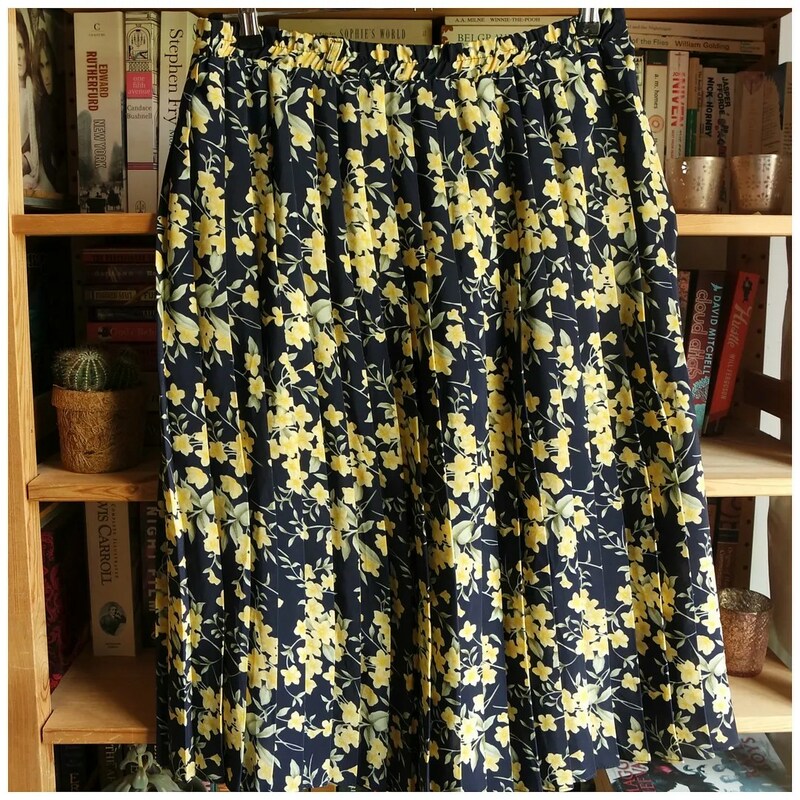 Since I prefer to wear skirts in the summer time, I thought I would share 5 of my favorite printed skirts. This first skirt is one of my favorites because it very much reminds me of the 60s. It has a mod vibe to it don’t you think? It is a mini length and has a fun monochrome print. 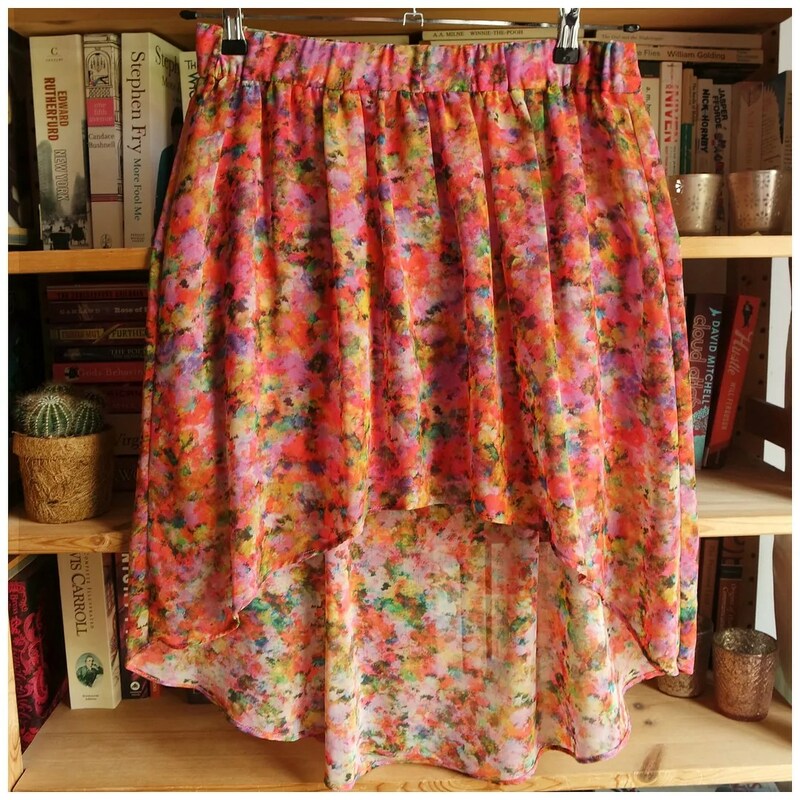 Because the print isn’t too out there color wise, this is a perfect skirt to pair with other colors. A bright blue or bright yellow and maybe even a red would all be colors that work well with this kind of pattern. Add on a fun shoe and you’re good to go. I’m not going to lie. The only reason I bought this skirt? Because it reminds me of an impressionist painting. I bought it some time ago, back when high-lo skirts were all the rage. I still like this though, mainly because of the perfect color combination. It is a bit of a difficult skirt to pair though, which is why I don’t wear it too often. Of course a plain white tee will work, or a grey, but I like to sometimes contrast a colorful item like this, so I think that a green or yellow might work well with this too. 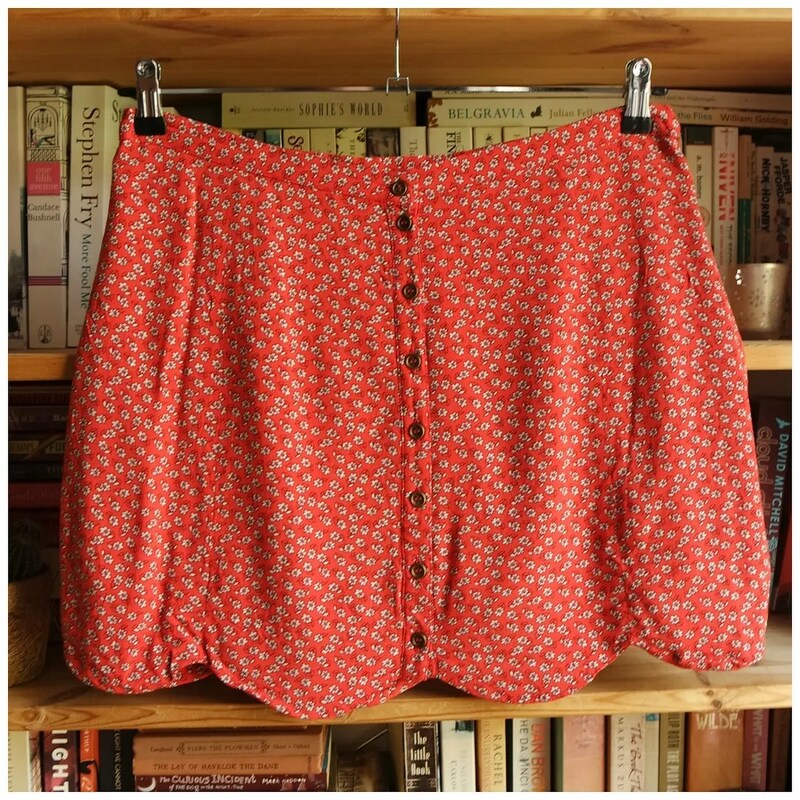 The next skirt is a vintage find. I had spotted this at a local vintage store and thought it a tad expensive for what it was. Then I attended their kilo sale at the end of the season and then this was in the pile! I got this for just a few euros and it’s a perfect summer skirt. Yes, it has that grandma chic vibe, which isn’t for everyone, but with other yellow items, this really makes for a fun summer outfit. When I spotted this skirt at Urban Outfitters on one of my trips to London, I knew I had to have it. A) It’s red, my favorite color. B) It has a scalloped edge, which I love. C) It has a button down front. In short, what is not to love about this? This is a skirt that I can year round as well if I like. It is a tad on the short side, so I prefer wearing this with tights in the fall time, but paired with a denim jacket it also makes for a great festival outfit. 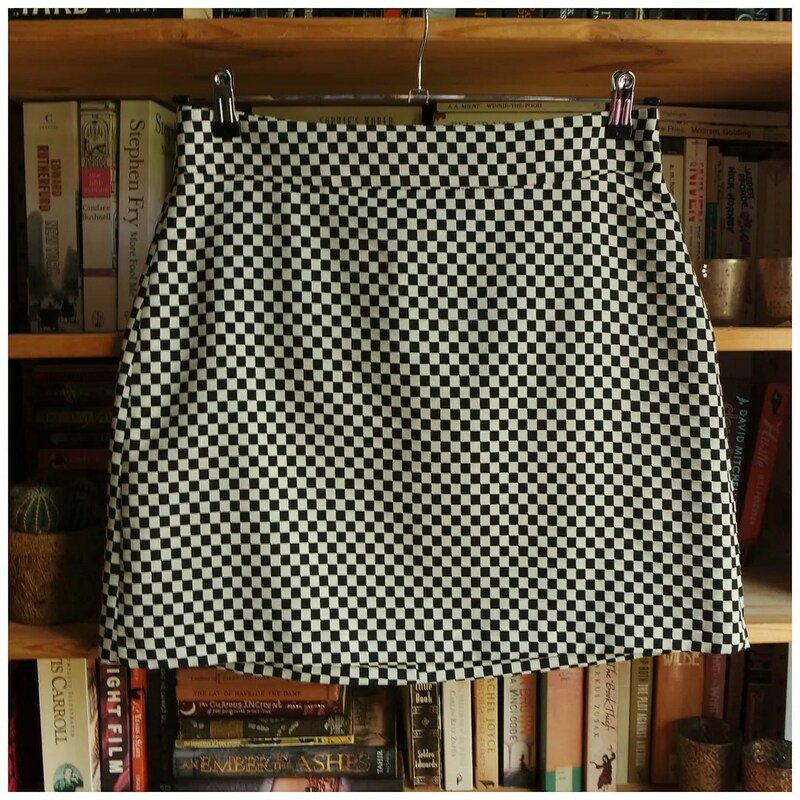 The last skirt is a circle skirt which is a super fun skirt shape to wear. I love pairing this with chunky knits as it is quite a girly silhouette. In the summer time, this is a great piece to pair with a knotted cropped top and a cute pair of sandals. 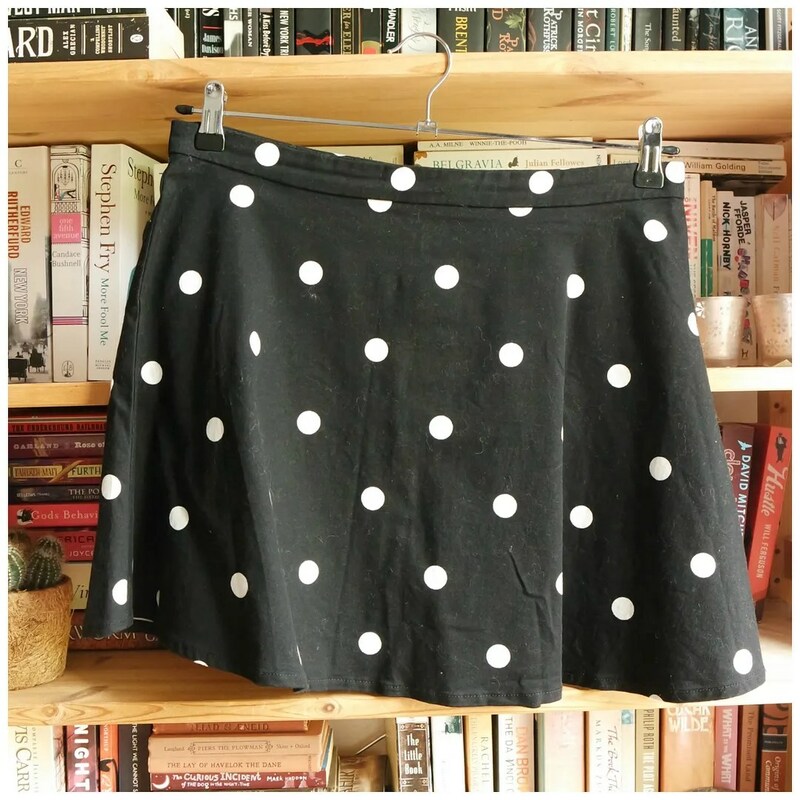 The polka dots aren’t too small, nor are they too present which means this is also a skirt that is perfect for creating a pattern clash. This works surprisingly well with stripes or smaller polkadots. Do you have a favorite printed skirt? Can’t pick a favorite, they are all so cute!! Thanks! I love a good skirt.